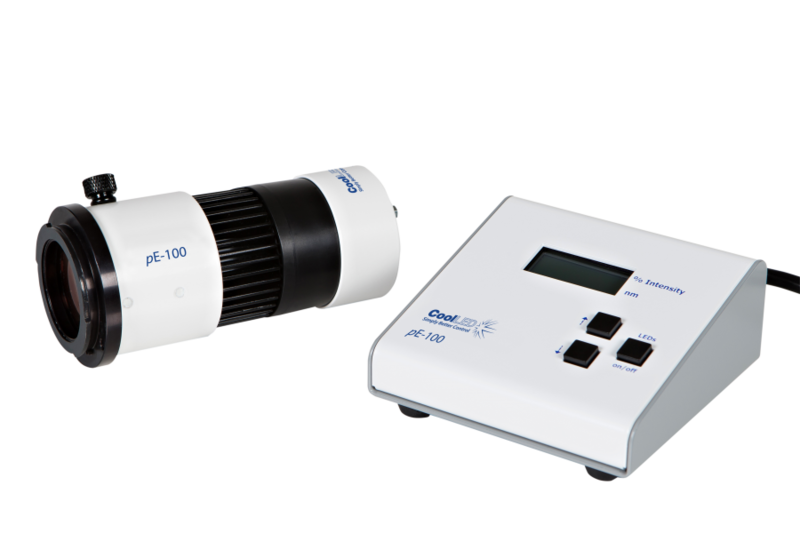 The pE-100 series is a mercury-free family of compact and simple to use LED illumination systems which can be configured to deliver light directly to a microscope, or via a liquid light guide or multimode fibre. Systems can be specified at any one of 20 different LED wavelengths ranging from the near-UV at 365nm to the near-IR at 770nm.Operation is by a remote manual control pod with instant on/off and intensity control from 0-100%. Remote control is available via a TTL trigger. The system has been developed for applications requiring a single LED excitation wavelength. It is perfect for clinical applications such as routine screening (e.g. using Auramine for Tuberculosis), for research applications requiring precise intensity control and fast-switching, or for electrophysiology applications where light has to be delivered to a specific location. The system comprises a pE-100 LED Light Source, control pod, and power supply.